California is home to over 175 community clinics and health centers (CCHCs) with over 1500 sites that vary widely in size. For example, in 2015, California had 51 CCHCs with over 27,000 patients, but nearly 30% of CCHCs served fewer than 5,000 patients, and roughly half had an annual budget under $11 million. 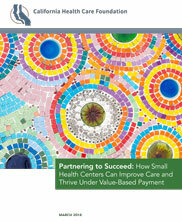 California’s CCHCs also vary widely in their capabilities to deliver high-quality, comprehensive primary care that is both responsive to the unique needs of safety-net populations and reflective of the new expectations of value-oriented payment. Value-oriented payment can offer primary care practices greater flexibility in care delivery and the potential to share in cost-savings in the broader health system. However, such payment models also require providers to assume greater accountability—and sometimes financial risk—for health outcomes, care experience and total cost of care. While some safety-net practices are embracing these new expectations and actively enhancing their clinical and business systems to keep pace—many are not. The California Health Care Foundation contracted with the MacColl Center for Health Care Innovation and JSI to conduct a literature review and primary research with CCHCs, and CCHC networks, IPAs, and consortia in order to: (1) advance understanding of the essential care delivery functions and aligned financial and health information technology (HIT) capabilities that safety-net practices must have in order to provide high-quality, comprehensive primary care; and (2) illustrate approaches for how these functions/capabilities could be built by and/or shared among clinics and community health centers of varying size and skill.